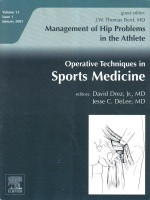 In this book chapter, Orthopaedic Surgeons Steve A. Mora MD, Bert Mandelbaum MD focus on major problems involving hip and groin injuries in the athlete. Topics cover soccer injuries, sports hernia, pubalgia, groin strains, hip arthroscopy, etc. The task of diagnosing and managing groin pain in the athlete represents a formidable challenge for sports medicine experts. Osteitis pubis should be considered in all athletes with groin pain, especially those athletes who participate in forceful kicking or running sports. Athletic osteitis pubis is believed to be caused by microtrauma and/or instability of the pubic symphysis, in contrast to obstetrical and urologic osteitis pubis, which are not associated with sporting activity. Osteitis pubis has been identified in a variety of sports including fencing, ice hockey, wrestling, Olympic walking, rugby, tennis, running, football, diving, and basketball. In athletes, osteitis pubis may evolve into a chronic, painful, disabling condition causing significant amounts of lost playing and practice time. Nonoperative treatment is successful in the majority of cases; however, complete recovery may take months. For cases that are recalcitrant to conservative treatment, surgical procedures addressing the abnormal pubic symphysis inflammation and instability have been described. Before surgery, it is critical that the clinician is certain of the diagnosis and that other disorders causing groin pain are ruled out. This article will take a detailed look at osteitis pubis and the procedures designed to treat this disorder when nonoperative measures fail.